Khalsa Reaper is used for reaping of soybean, grams, pulses and it’s kind of other crops. Khalsa reaper can reap 10 to 15 Acres per day. Khalsa Reaper is working 2 to 2.5 inches above ground. Khalsa Reaper can be fitted on any tractor. Khalsa Reaper used for clean & smooth cutting of crop. This is a highly recommend cutter for soyabean, moong, udad etc.crops .This cutter cuts crop from very lower hight even lower than a farm Labour could cut .No major jerk is given as it is with Labour cutting.Helps to reduce requirement of manpower and getting maximum yields due to avoiding spoiling of beans. 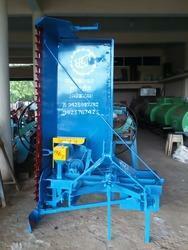 Specially designed for reaping of soybean, grams, pulses and its kind of other crops. A new invention in the category of harvesting machines.